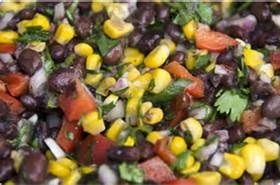 These black bean salad recipes are fresh, hearty and filling. They are enough to be served as main dishes and are great for lunch, brunch and to take along on a picnic or outdoor celebration. Finish off these salads with fresh salad greens garnished with such tasties as sliced tomatoes, avocado cubes, radishes and green onion curls. Rinse and drain the black beans and toss with the peppers, lime cumin vinaigrette, parsley, cilantro and oregano. Taste for salt and season with pepper. Use a press or mince the garlic clove. Combine in a bowl with lime zest, juice, green onion, jalapeno and cumin. Whisk in the olive oil and adjust for balance of flavor. 12 Spanish olives, pitted and thinly sliced. You can use pimento stuffed if you must! In a bowl mix together the beans, celery, olives and oregano. In another bowl, whisk the vinegar, garlic, salt and pepper and the olive oil. Taste for balance. Pour over the bean mixture and mix gently. Preheat a medium skillet over medium-high heat with the olive oil. Add the onions, garlic, jalapenos, zucchini and salt and pepper. Stir frequently until onions are translucent, about 3 minutes. Add the corn kernels, stir to combine and cook for about 2 more minutes. Add the black beans and the chicken stock or water and cook until the beans are heated through. Add the orange and lime zest and the lime juice and parsley.